Peekaboo Patterns is a store in Chennai that specialises in making unique and adorable gifts and décor for kids and their rooms like mobiles, rugs, toys and even furniture. They even offer customisation! Walking into Peekaboo Patterns is a lot like walking into furniture Disneyland. Delightfully soft furniture in bright pops of colour are everywhere and it’s really hard to resist the temptation to buy something for yourself instead of your favourite baby/niece/nephew. I particularly loved their soft bean bag chairs, which are essentially bean bags with a bit of structure in them so they look like tiny sofas! It’s ultra-cute, and they even offer customisation so you can get a name sewed on to the chair too. The chairs come in several colours and themes – you can pick up a circus themed bean chair, a jungle themed one, garden themed, sporty themed or even one with Indian motifs on it. They cost INR 5,000 which might seem steep, but they’ll make great birthday presents that will be appreciated by parents and babies alike because they’re the sort of things that will last much longer than most baby products, like clothes or toys, do. 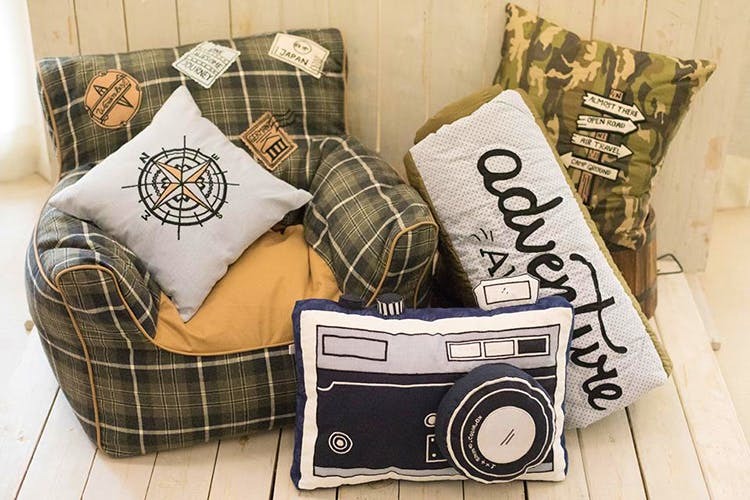 The store also sells colourful pillows in a variety of shapes, long cushions with gorgeous applique work that are just perfect for the crib, quilts and themed bed linen. Their themed decal stickers, massive floor cushions and vibrant rugs are a must if you are decorating your child’s nursery. If you have a slightly older kid in your life, you can still check out their range of accessories for young school-going children like backpacks, water bottles and lunch boxes. They also have indoor tepee tents which are so gorgeous and are perfect for creating a cosy little reading nook inside any room. We’d recommend you pick one of these tents up for yourself, irrespective of whether you have a baby in your house. They’re that cute! Peekaboo Patterns also stocks innovative toys that you wouldn’t normally find in generic stores like handmade felt finger puppets, felt valances, wooden play tools and puzzles. If you’re looking to pamper the baby in your family or life, head straight to Peekaboo Patterns. You will not be disappointed. Prices start at INR 250; shop online here.